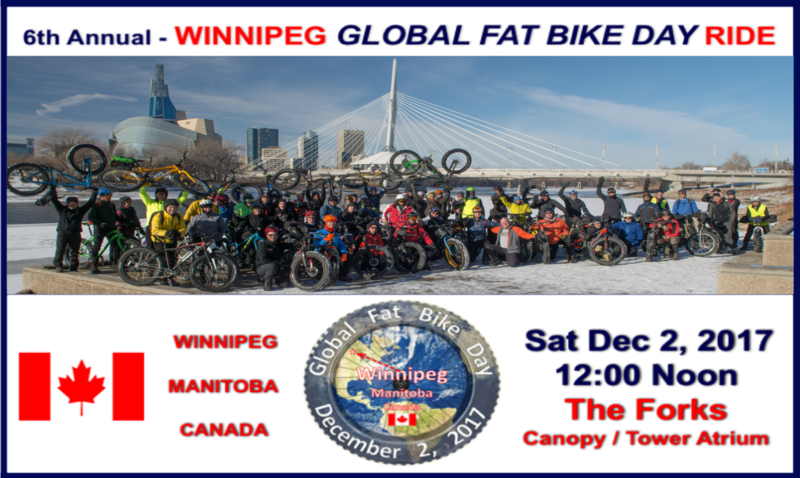 The purpose of the Fat Bike Manitoba (FBM) website is to coordinate rides, races, events, and fat bike news, to celebrate what’s happened and share the fun all over again; to support trail development and other advocacy efforts, and to provide important technical information about fat biking for readers. This site continues from the original ManitobaFatBike.com (MFB) blog created by Ian Hall and supported by other active members in the Manitoba fat biking community. MFB blog posts have been archived into FBM. Category tags have been added to archived items and new FBM posts in order to aid searching for specific information. The history, lessons-learned, techniques and cool ideas arising from fat biking in Manitoba are saved here and are accessible to all. Fat biking has been exploding in popularity around the globe for a number of years now. 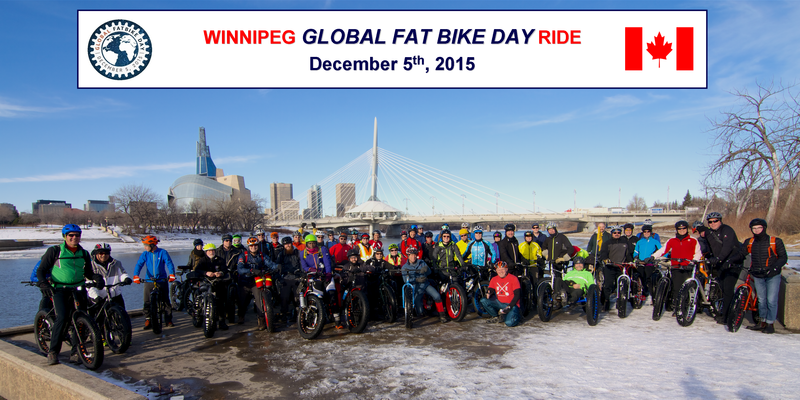 Here in Manitoba, fat biking has grown steadily since 2012. Rider numbers kicked up a notch after the first Actif Epica winter ultra Race in 2012 on Manitoba’s Crow Wing Trail. The 2014 Fat Bike Birkie race in Cable, Wisconsin, where 500 fat bikers lined up on the world famous Birkebeiner ski trail, showed Manitobans what the tourism, trail development and active health potential is for local fat biking. Even in the dead of night, our numbers continue to grow with regular trail rides. … or we get onto frozen creeks and rivers like the Seine, Red or the La Salle. The “Polar Bear” Lake Winnipeg Double Crossings and the Lake Winnipeg Fatbike Crossing & Campover adventures, have shown us what can be done and the fun to be had on one of the most challenging and glorious lakes on the continent. 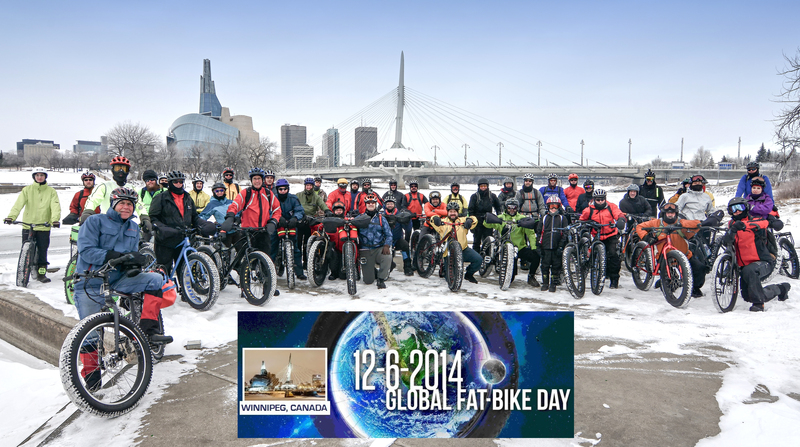 Our Winnipeg Global Fat Bike Day Rides in have been great success stories! Against the stunning back drop of the Canadian Museum for Human Rights at the Forks, even more fat bikers have connected, shared stories and became motivated to explore the trails and join events and races in and around Manitoba. Local Fatbike racing took off in 2016 with a very popular race at Bison Butte at Fort Whyte Alive in Winnipeg! Thanks to 2 Wheel Revolution we have enjoyed two years of Manitoba Fatbike Race Series on groomed winter singletrack trails at locales like Falcon Ridge, Birch Mountain, Bison Butte-Fort Whyte, and soon the Forks right in the heart of Winnipeg! – provide important technical information about fat biking for readers. – support all people and entities connected to fat biking, while remaining impartial and neutral towards to specific bike shops or businesses! – accept advertising or promotion of rides, events and races that are connected with a business or bike shop. Send us your event details with links and posters! Please feel free to make posts describing your ride, event or race plans. – moderate posts and other communications for inappropriate content and language. – encourage any fat biker to share adventures, enthusiasm and lessons-learned by posting through ride, event and race reports, or other stories, pictures, videos and comments. – invite fat biking Manitobans to become contributors (posters) to the FBM website by simply sending an email (see Contact). FBM reserves the right to moderate posts by suggesting changes, making corrections or removing posts or comments that are objectionable, contain inappropriate advertising, or that harass, insult or bully others. In extreme cases, FBM may remove or deny access to the FBM website.